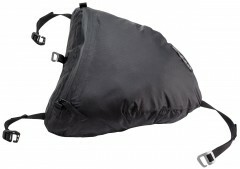 The Black Diamond Cirque packs are plenty spacious, especially given their efficient sack-like design. However sometimes you just need that little extra bit to tack on. Add the Cirque Lid and the problem is solved. This ultralight SilNylon triangle weave quickly adds another few liters of space. This helps make the Cirque ski mountaineering packs some of the most versatile on the market.